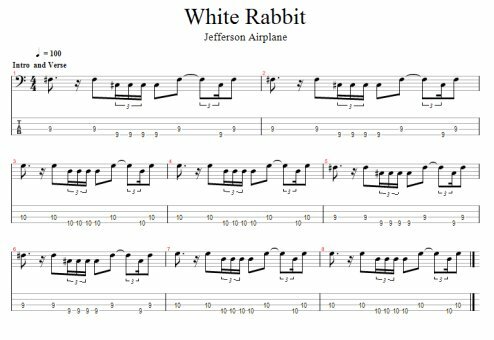 This tab is for "White Rabbit" by Jefferson Airplane. In order to fit the tab on this page, just some of the sections are tabbed. This free Guitar Pro bass tab is meant just to get you started. This song was featured on Jefferson Airplane's 1967 album "Surrealistic Pillow". The song was ranked #478 on Rolling Stone's list of the 500 Greatest Songs of All Time, #60 on Rate Your Music's Top Singles of All Time and appears on the The Rock and Roll Hall of Fame's 500 Songs that Shaped Rock and Roll. The song was written by Grace Slick before she joined Jefferson Airplane. It was one of the first songs to make it past the "drug censors" on the radio stations. Jack Casady was born in Washington DC and was playing in clubs with Little Anthony and the Imperials and Ray Charles when he was still not old enough to get into the clubs. Casady is considered an innovator in that he went beyond the "backup rhythm" concept of bass and began to explore more melodic ideas. 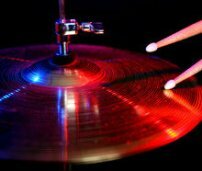 He can be heard on recordings by Jimi Hendrix, The Grateful Dead and Country Joe and the Fish, to name a few. Here is the tab--Have Fun! If you would like to make a small donation to keep these tabs free, it will be appreciated! Absolutely Free Guitar Lessons! Get free guitar lessons--scales, chords, lead guitar, alternate tunings and much more!